Dear Friends, My book [in Swedish] “A world addicted to oil” should have been printed by now but when I came write the chapter on climate change I realized that I needed to wait to see the result of the COP21 Conference (It will also come in English). 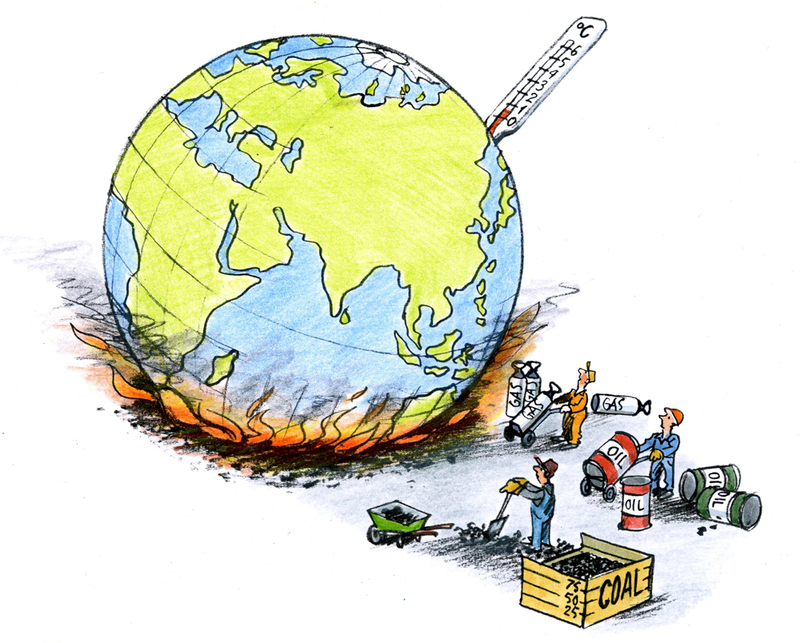 With a hammer blow in Paris COP21 approved a new climate treaty. There was celebration, hugs and tears and the nations’ environment ministers partied. The goals for limiting global warming were narrowed. Now that warming is to be held “well below” +2 C and nations will make efforts to restrict warming to +1.5 C. The treaty lacks numbers and a corresponding timeframe and if one studies the scenarios presented by the IPCC in 2014 one can understand why. The emissions reduction measures required to restrict global warming are unrealistic but one can conclude that at least the intention was good. Since 2011, climate researchers have been using 4 scenarios when they estimate future temperature increases. These are named RCP2.6, RCP4.5, RCP6.0 and RCP8.5. The number in the name of each scenario represents the degree to which heat radiated from the Earth is captured by the atmosphere and radiated back down. If our goal is to restrict warming to less than +2 C then only one scenario can deliver this – the RCP2.6 scenario is thought to provide a temperature increase of 1.5 C. IF we examine RCP2.6 we can also find some of the numbers that were not apparent in the final decision in Paris. We can see in the graph in the top left corner of the figure above that this requires CO2 emissions to be zero in 2080. How is this to be achieved? What sacrifices will be required? If we look at rates of oil consumption under the four scenarios we can see that RCP8.5 can be immediately dismissed as completely unrealistic. It is impossible that the world would be producing oil for consumption at a rate of 160 million barrels per day in 2070. Scenario RCP2.6 that is the oil consumption solution we all want is similar to the geologically-restricted future scenario of oil production that Colin Campbell and I published in 2003. As far as oil is concerned, Peak Oil will evidently be the savior of our future. But it is not just oil that must be contributing zero carbon dioxide emissions in 2080 but also coal and natural gas. So we should examine the entire energy consumption required under RCP2.6. Compared with current levels of primary energy consumption the projections associated with RCP2.6 show a doubling of energy consumption by 2100. Carbon capture and storage (CCS) can reduce CO2 emissions and in 2100 we see that the amount of coal use exploiting CCS is equivalent to current levels of coal production. The total rate of coal consumption is expected to be greater than today which is also unrealistic. The coal reserves owned by the Swedish company Vattenfall in Germany will need to be used at the maximum possible rate and the CCS projects will need to be restarted. CCS techniques will also need to be applied to large amounts of natural gas and even oil bio consumption will use the technology. If RCP2.6 fails then the show is over. The next scenario, RCP4.5 also uses large amounts of coal involving CCS technology and uses more oil than is actually possible. The RCP2.6 scenario also foresees an amazing increase in nuclear energy after 2070. So the fact is that the changes that the world’s environment ministers agreed on are incompatible with any realistic scenario. The hammer blow that signalled the start of celebrations, hugs and tears is a dream, and for our world, our children and our grandchildren it is a beautiful one. But reality is still reality and aspects of that real world will be presented in my book, “A world addicted to oil”. Only in a dream world can the world’s reserves of coal be burned and the resulting CO2 stored underground. Everything points to the climate treaty’s ambitions being illusions writ on paper. ← COP21 – Jubel i Paris, men man presenterade inte verklighetens siffror.